Mike Piazza has written a new book in which he claims that Dodgers fans turned against him during his ill-fated contract negotiations in 1998 because Vin Scully asked him about it during a Spring Training interview. 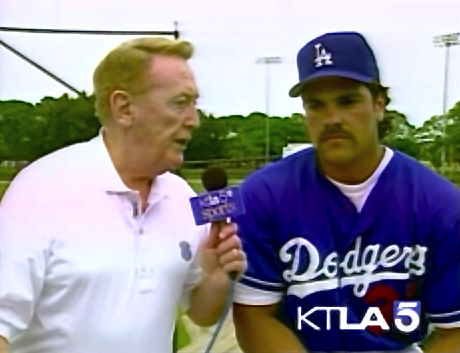 As he started the season poorly at the plate, “Vin Scully was crushing me,” Piazza concluded. The ‘crushing’ 1998 Scully interview on my alma mater KTLA is available online. Watching it, it can only be hoped that Mike hasn’t seen it, and had it (mis)interpreted for him by someone who has since been treated for paranoia or at least crippling – maybe the right word is crushing – tone deafness. While branding himself just a fan, Scully has actually done something that a fair reporter does (and so it is rarely seen or heard or done). He offers Piazza the opportunity to say that the characterization as an “ultimatum” of the timeline he set for the Dodgers to sign him to a new deal – a very fair thing for Piazza to do with free agency seven months away – was inappropriate or incorrect. Here that stinker Scully goes again, giving Piazza a chance to say it’s not an ultimatum, that he doesn’t want the thing to drag through the season and potentially ruin 1998 for him, or the Dodgers, or the franchise for the next decade (or, as it proved, all of the above). Ah, but that’s when Scully absolutely destroys Piazza. At this point Scully literally turns the interview to the question of Piazza’s knees, and then how many stolen bases Piazza had in 1997, and the next we hear of this almost milquetoast chat, it’s fifteen years later and this – not Piazza’s intransigence in negotiations nor the lunkheadedness of the Dodgers’ then-new owner Rupert Murdoch – this Scully interview is what induced Armageddon at Chavez Ravine. Scully was understandably mystified. “As God is my judge, I don’t get involved in these things,” he told The Los Angeles Times. “I can’t imagine I would ever put my toe in the water as far as a player and his negotiations. What Piazza was trying to do in the interview, of course, is exactly what he has so belatedly and unfairly accused Scully of so many years later. He was trying to influence Dodger fans. He wanted them to rally to his side. He wanted them to help him pressure the team to give him the money (now a ridiculous-sounding $105 million over seven years – $15,000,000 a season). He didn’t want to issue an ultimatum, but he wanted them to think there was an ultimatum dictated by circumstances and he had done all he could to avoid it and would continue to do so and gee don’t the Dodger Dogs smell good? Again, one hopes Piazza hadn’t seen the interview and simply had it recounted to him by somebody who didn’t get it. You know: somebody who doesn’t understand English. That Piazza had a totally hit-and-miss record with, and understanding of, the media (if asked in 2000 to identify the most cooperative MLB star and the least cooperative one, my answer each time would’ve been “Mike Piazza”) suggests otherwise. The sadness here is that until the release of his new book, Piazza’s exit from Los Angeles had been seen as one of the sharpest downhill turning points in the years between Kirk Gibson’s homer and the day the franchise was wrested away from Frank McCourt. If Dodgers fans did have it in for Piazza – because of Scully or their frustration or the shape of his mustache – they quickly turned. For nearly all of the last fifteen years he had been viewed as the victim in the equation, and his departure as an unnecessary and uncorrectable mistake. Until, that is, he went and blamed Vin Scully, of all people, and forever made it look like Rupert Murdoch was the good guy in all this. I have been inundated on twitter and even by email for weeks with questions (specifically “did you buy it?”) about a 19th Century baseball photograph that sold at auction yesterday in Maine for $92,000. No, I didn’t. It’s not really a baseball card. Before I explain that seemingly odd statement – I mean, it’s a picture of what was then a major league baseball team, it’s on cardboard, and the French term for what it is includes that country’s word for ‘card’ – let me mention that I don’t disrespect anybody who disagrees with my conclusion, and that the idea of which items from the pre-1886 era are cards and which aren’t is very fluid and very open to interpretation. 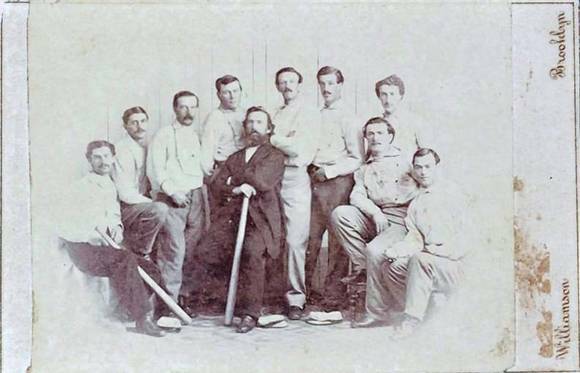 It is a great image of the 1865 Brooklyn Atlantics, who were then competing in the very loosely organized and intermittently professional National Association of Base Ball Players, which preceded the first semi-organized professional league, the National Association (1871), and the first truly recognizable modern league, the National League (1876). I can understand his confusion. I have friends who, like me, are specialists in 19th Century cards who think this is clearly a card, and others who don’t. Obviously I fall into the second category, as does one of the foremost experts in the field who told me last month he certainly would like to have it, but not if it was going to cost very much. I’ll get to the cost in a moment, but first, the what-is-it part. In the middle of the 19th Century, if you visited somebody – especially if you went to their home and they were out – you were expected to leave your “calling card.” These were ornate ancestors of the modern business card and while they could be art-like, they were as limited as the business card is today. Then came a big change. Photographs were cumbersome things to make and distribute until 1854, when French photographer Andre Disderi developed a method to take eight of them on a single plate. Whereas previously if you wanted eight pictures of yourself, you had to pose for eight separate shots and have them developed eight separate times, with Disderi’s system you still had to pose eight times, but they could all be developed and printed simultaneously. Later improvements allowed for those eight poses to be reproduced again and again, cutting the cost and cumbersomeness of production even further. Soon, the cost of a photographic card of yourself was not much more than the expense of an ordinary calling card. Thus, the French version of the card – the carte de visite – was adorned with an image. If you had any money, you had stacks of picture cards of yourself to hand out on all occasions. Photography studios soon began to clean up not just by custom-producing cards for individuals, but by creating and selling poses of celebrities. The tipping point in France was the Disderi cartes of Emperor Napoleon III, which he began to sell in 1859. 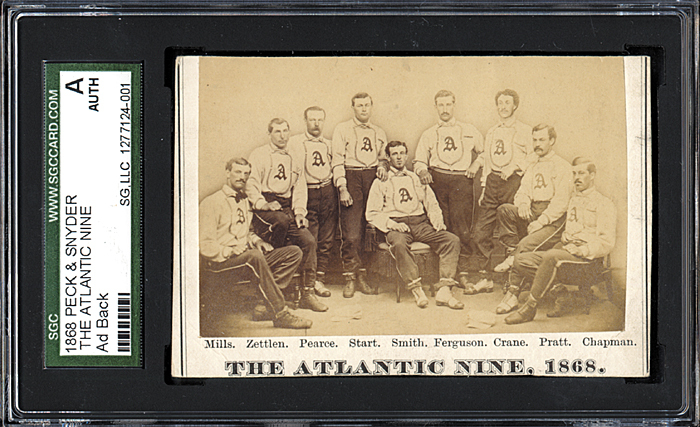 So by the 1860’s – and certainly long before the 1865 Brooklyn Atlantics posed for the photograph that sold for $92,000 on Wednesday – there were cartes de visite that were used like today’s business cards, and others that were collectibles. There are cartes de visite (CDVs) of everybody from the heroes of the Civil War to John Wilkes Booth…to baseball players (I’ll correct myself to the spelling of the day: base ball players). If these two criteria – multiple cards, advertising intent – were not used and met, it literally meant that anything anybody ever made showing a baseball scene was a baseball card. That would be mean every photograph was a card, and every newspaper engraving, and in theory every drawing done by every kid since the first ball player was mistake for a hero. 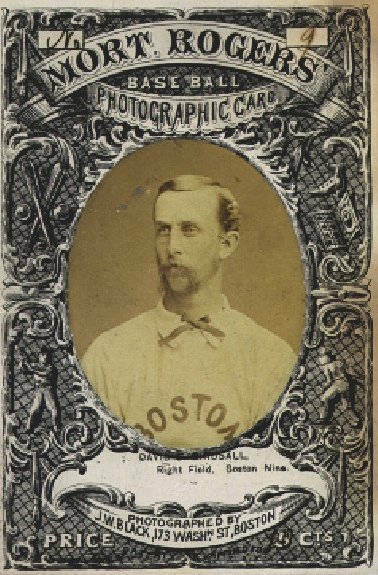 So, the 1865 Atlantics carte de visite, while a great item, doesn’t meet the standard definition of a baseball card. C) cost extra because the photographs were designed to be saved as souvenirs. Those are baseball cards. The records of how many were sold even survives: 150 of future Hall of Famer Harry Wright, 57 of a player named Crossley, 47 of another named Hammond, and 11 of Harry’s father Sam. A fifth card later surfaced showing the Wrights together, and two different poses of Crossley are known. Cards-as-tickets haven’t been repeated too often in the 150 years since (the White Sox did it in the early ’60s). So if you want something more recognizable, you move to the Peck & Snyder cards, issued over three years to advertise Peck & Snyder Sporting Goods stores (and available for other such enterprises to print their ads on, as well). The “set” begins with the 1868 Brooklyn Atlantics, continues with the first overtly all-professional team, the 1869 Cincinnati Red Stockings, and moves on to the 1870 Troy Haymakers and Chicago White Stockings. That’s the 1868 Peck & Snyder Brooklyn card, front and back. See that guy “Pearce”? He was essentially baseball’s first shortstop, and he should be in the Hall of Fame. He and first baseman Joe Start – and a couple of the other guys – are also in the 1865 Brooklyn picture about which we’re talking here. 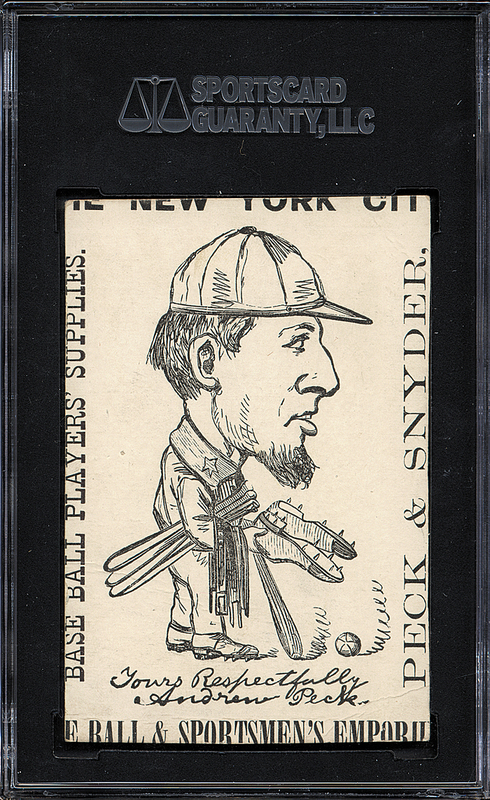 Interestingly, the truly big idea for baseball cards, the seemingly obvious one – make lots of cards of lots of different players – was still nearly 20 years in the future when Mr. Peck let himself be caricatured on the backs of those team cards. 1886 was the breakthrough year, with Goodwin Tobacco (“Old Judge Cigarettes”), the Hall Photography Studio, and an anonymous manufacturer that left room for local cigar stores to stamp their ads on the cards, each made multiple-card sets of players of the New York Giants, and the Charles Gross Company began a marvelous two-year issue featuring the New York Giants and Mets and also both Philadelphia teams, the Athletics and the Phillies. A year later, Goodwin saw the potential bonanza and issued fairly cheap photographic cards of literally hundreds of players in overlapping issues that would see some guys issued on 17 different cards over the 1887-1890 seasons. Goodwin and other tobacco companies also went high-tech with beautiful color lithograph cards of the great players of the time (along with other athletes) later in 1887. The rest, through fits and starts, has been one of the more astonishing industries in American history, still going strong since 1886. Or 1865. Or 1863. 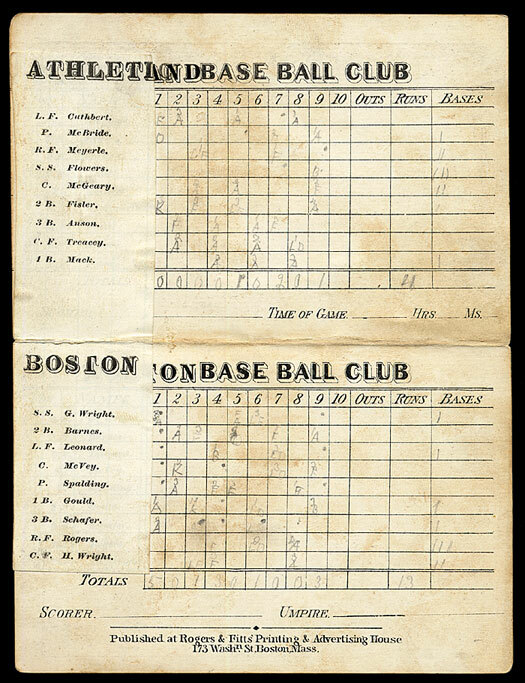 Those who might have thought of making cards of individual players could conceivably have been scared off by the experience of Mort Rogers, a former player who got the idea of selling scorecard/programs at the games of the Boston Red Stockings in 1871. He produced startlingly beautiful folded cards that had photographic portraits of players on the front, an ad on the back, and a scorecard in the middle. He apparently lost his shirt. A similar enterprise was tried almost simultaneously with those Troy, New York Haymakers of 1870 and 1871. Finally, a note about the $92,000. That’s a lot of money for anything, let alone a baseball card, but it isn’t extraordinary. At least one card has sold for $70,000 in the last month (one of those 1886 Old Judge New York Giants) and prices in that range are not uncommon for the scarcer cards in the 1886-87 Gross set (“Kalamazoo Bats”) and the 1887-90 Goodwin Old Judge series. 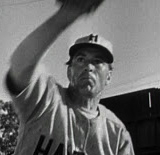 E) Proves the involvement in the making of the film by two of the game’s great characters, Babe Herman and Lefty O’Doul. F) Notes and explains why the rightfielder in some of the shots appears to be playing about 20 feet behind the first baseman. It is, as I say, terrific research terrifically explained. I can add only one detail to it – something that had always bothered me about the ‘then he ran down the third base line’ legend. The human face is not symmetrical. We know this so intuitively that we don’t usually even think about it. But you know when a picture of you has been reversed, or you’re looking in a double mirror. 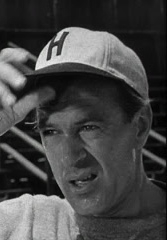 On the top is Gary Cooper as Gehrig, in a still frame that Shieber has determined is an original, unflipped image. 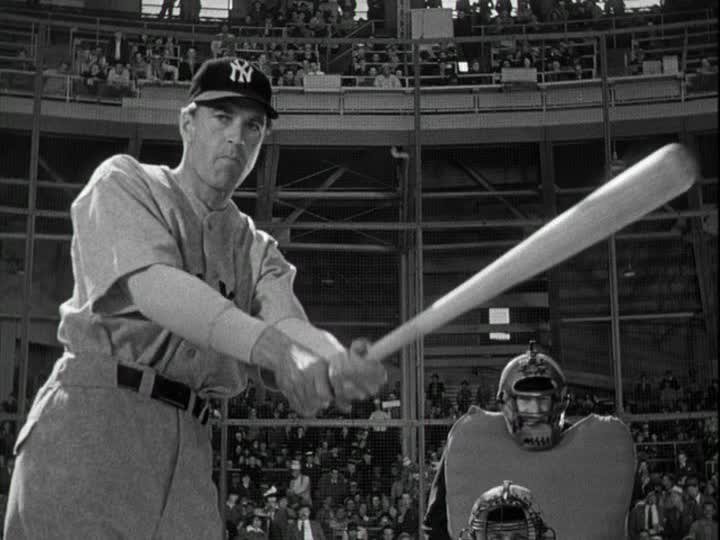 Below is Gary Cooper as Gehrig, in a still frame that Shieber can prove has been flipped. Look carefully at the features of his face – they’re not in the same places in each shot. It takes a little work, but it’s worth it. Then in this one scene at first base comes this bizarre image of a guy who looks enough like the Cooper we’ve seen throughout the flick to be his twin – but it is not an exact match. The nose breaks in the opposite direction (just a little bit). The veins on one side of the neck now match the ones on the other side of the neck. It’s all subtle, but it’s all the photographic equivalent of circumstantial evidence.